The Barbie doll came out in 1958. Ruth Handler, a co-founder of the Mattel Company, named the doll for her daughter, Barbie. The Barbie doll was designed to be a dimensional type of paper doll for dressing up with pretty clothes. 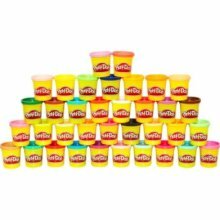 Play Doh was designed in 1955 as non-toxic wallpaper cleaner that was reusable. That same year, Play Doh started to be used as a harmless substitute for modeling clay. The McVicker brothers manufactured Play Doh under Rainbow Crafts Company. At first, Play Doh came only in white, but soon was available in bright, primary colors. It has remained popular and now comes in many bright, even neon colors, and is still the bane of moms and their carpets. In 1870, William Russel Frisbie, a baker, put the family surname on the reusable pie plates with the hope that when a housewife saw his name, she would want to buy a ready made pie and not bake a pie. In the 1940's, Yale students starting throwing and catching the Frisbie pie tins. In the 1950's, William Frederick Morrison made a disk shaped like a saucer and sold his idea to Wham-O, who sold the disks. The president of Wham-O saw the pie plates being thrown and caught at Yale. Upon his return to California, he renamed the plastic disks. The second "i" was changed to an "e", thus the name Frisbee. The Frisbee is still a very popular toy. When on a trip to Australia, a friend of the president of Wham-O saw children turning bamboo hoops about their waists while exercising. In 1958, Wham-O produced 15 million hula-hoops in bright colors. After much perseverance, George Lerner made Mr. Potato Head a favorite toy. Lerner first created plastic face parts to be put on fruits and vegetables. The toy companies thought that parents would be too cautious about using food to play with after World War II. Lerner sold his plastic toys to a cereal company. He didn't give up on his idea. Lerner pitched his idea to Hasbro, a small company at that time. After buying back his plastic face parts from the cereal company, Hasbro advertised Mr. Potato Head on television in 1952. At first, the Mr. Potato Head toy used a potato for the plastic face parts. Eight years later, a plastic body was included. In 1927,PEZ was a mint dispenser invented by Edward Haas, an Austrian candy maker. Oskar Uxa, an employee of PEX changed the dispenser to resemble a cigarette lighter. In 1955, PEZ decided to put heads on the dispensers and sell them to children. PEZ dispensers are popular collectibles with new designs being created all the time.